Property 22: Pavilion even foot, two rooms, veranda, garage on plot of 500 m2. 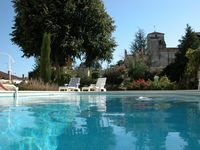 Property 28: Gîte with heated shared swimming pool. Ideal for families with young children ! Gîte with shared,heated swimming pool. Ideal for families with young children! Property 32: Gîte with shared,heated swimming pool. Ideal for families with young children! Property 34: Gîte "The little Rominois"
Gîte with shared heated swimming pool. Ideal for families with young children! 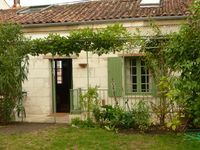 Property 47: Gîte with shared heated swimming pool. Ideal for families with young children! Friendly may be an odd way to describe a house, but it was definitely how we felt about this lovely spot. The location is great, close to everything you could want or need, but far enough that it was incredibly quiet. The garden is a little oasis and we spent a lot of our time there. But even if the weather had not permitted us to do that, the house is wonderfully comfortable and spacious, the kitchen fully equipped with seating for 6 and the living room cozy and welcoming. Anne Marie was a pleasure to deal with. We really didn't want to leave! Merci, Anne-Marie, pour un s&eacute;jour parfait &agrave; Saintes! We loved our stay and found the house very well equipped throughout, even down to the bicycles in the garage. We enjoyed BBQs by the pool which was a perfect temperature and very well looked after. We enjoyed trips locally and went canoeing and to cafes and restaurants in Pons as well as venturing to Saintes and Royan. We were grateful for the efficient air conditioning in the heat wave we experienced and really enjoyed our stay, if we had to find any fault it would only be that some of the beds were too hard! Overall we would highly recommend our stay.